"taken to Prince Rupert in 1923, Chief Edenshaw's house, by actual measurement, 58' wide, 60' in depth, totem pole about 42', grooved, front beam, 4'4" in width, height at the corner roof beam about 10 feet, height at center roof beam about 13 feet, measured by C. de B. Green, P.L.S., and C.F. Newcombe, photo by Anderson" from the reverse of the oversize. came to the Prov. Museum Aug. 1965 and sent to Masset museum, March, 1976. 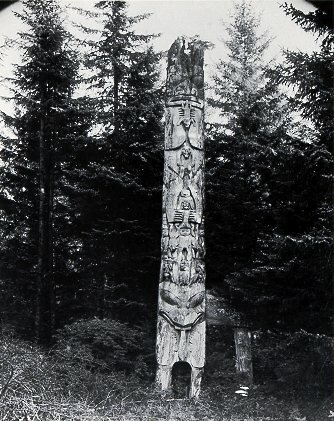 "Edenshaw's Hliellen Pole, Tow Hill -Raven above, grizzly below" from print in album B.
location: this has been changed to Tow Hill because both the writing beneath the print in album B and page 10, Drew's Totem Poles of Prince Rupert state that the pole is from Tow Hill. D.S. May 4, 1979.